Weddings are joyous moments in every couple’s journey together. 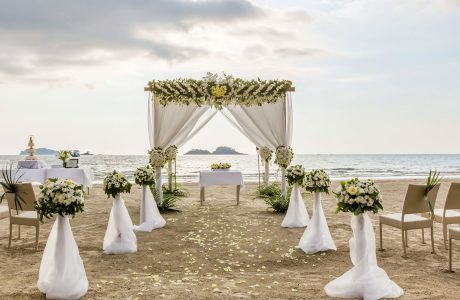 Koh Samui is known to be the most romantic wedding destination in the world. Located at the end of the beautiful and calm bay of Bophut in Koh Samui, Adarin Beach Resort is the perfect place to host your tailor-made event and enhance your experience. From an intimate couple event or up to 80 guests, your personal wedding planner will make sure that your day is a memorable one. 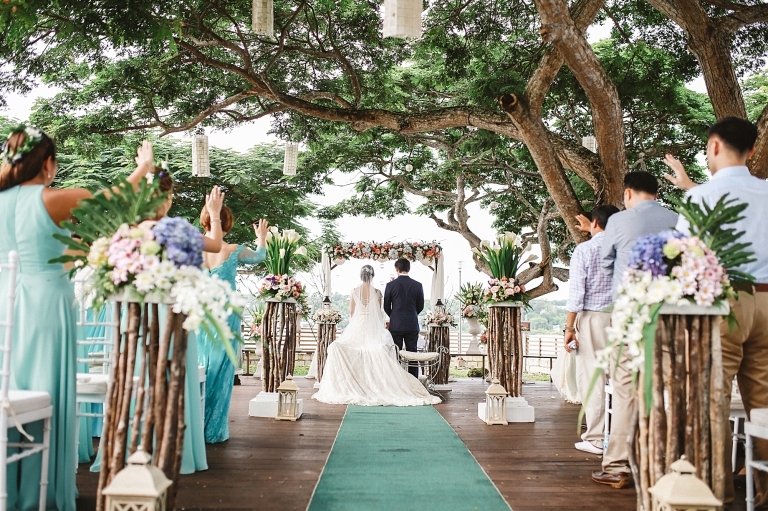 Imagine exchanging vows with your beloved while the warm tropical weather makes everything seem more vibrant. Picture yourself and your special one hand in hand while strolling at the beach where turquoise waters and fascinating white sand sway. It is true that Adarin Weddings are definitely magical and are filled with romance. A team of wedding specialists from Adarin Beach Resort will create your dream wedding tailor-made based on your wishes by providing you with a very personalized service from the early stages onwards. Your beautiful ceremony will be complemented with many sophisticated solutions: elegantly simple or filled with majestic flair. A wonderful set up at the beach on your chosen time of the day will be thoroughly prepared. Every single detail from the décor, food to the cake will be carefully planned for. Adarin Weddings are more than just events, but moments to be cherished for a lifetime. Adarin Beach Resort exceptional location lends itself to almost any kind of wedding from intimate affairs to grand celebrations, as well as memorable events to mark any special occasion. We invite you to work with our dedicated Wedding Planner to create something entirely unexpected or tailor-made one of our wedding packages. Celebrate your wedding in a beautiful location with tropical character. Adain Classic Western Ceremony provides customized service from your own choice of wedding decorations to a unique dinner reception, simple yet romantic. The price is inclusive of 7% Government Tax and 10% Service Charge. A wedding date or event will not be confirmed unless a 30% deposit is received and an official confirmation from the wedding planner has been sent. 90 days prior to the wedding ceremony date, deposits are refundable by 50% and less a 15% admin fee. 60 days prior to the wedding ceremony date, deposits are non-refundable but can be transferred to other services such as accommodation, other events, etc. Refunds take 21-30 processing days by the bank. 15% admin fee is required for any refund payment and is allocated solely to the bank, not Adarin Beach Resort. A little more luxury than Classic Western Ceremony? Adarin Deluxe Western Ceremony offers you a stress-free wedding starting from a well-organized plan by personal Wedding Planner to a relaxing couple’s aromatherapy massage at Le Spa Zen. The best way to understand Thai customs is through a Buddhist Thai Ceremony. Commencing with a traditional Thai drum parade, the couples then will be blessed by sincere monks, friends, and family through the water blessing ritual to the symbolic love tree planting. Secluded Beachfront Sala for Monk’s blessing. A mix of Thai and Western ceremony will definitely fulfill your desire. 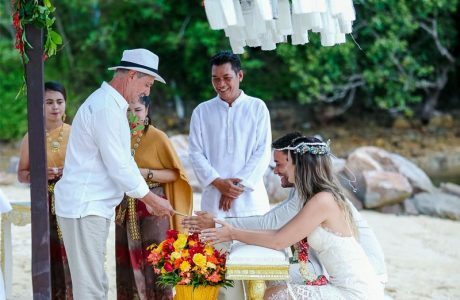 You are able to experience the romantic Western ceremony with hints of traditional Thai rituals, enhancing the exotic vibe of holding wedding in Koh Samui. 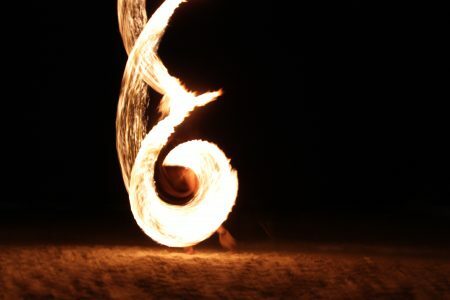 Want to capture the once-in-a-lifetime moments or looking for an amazing fire dance show after dinner reception? Find out how you can celebrate before, during, and after your wedding ceremony.